Have you heard the latest episode of the JustUs Geeks Podcast? Click here to listen! It’s time for another installment of Movies You Have Not Seen But Should. For those who are new to this series, we take a look at films you may not have seen or films that you may not have seen for a while. This week we will look at the 2012 historical drama Emperor. The film stars Matthew Fox and Tommy Lee Jones. The film is set immediately after the end of World War II. The United States has just defeated Japan and is now occupying the country. General Douglas MacArthur (played by Jones) is tasked as the Supreme Commander of the Allied Forces and is placed in charge of the occupation. He arrives in Tokyo with the job to rebuild the country and places those Japanese leaders who were instrumental in causing the war to be arrested for war crimes. One of the key figures to be investigated is the Emperor of Japan, Emperor Hirohito. MacArthur places Brigadier General Bonner Fellers (played by Fox) as the man to investigate whether Hirohito should or should not stand trial for war crimes. This is not an easy job for Brigadier General Fellers. The occupying Americans are not looked upon highly in Japan. Few people want to cooperate with him. On top of that, people view the emperor as like a god. However, Fellers loves the people of Japan. Before the war, he had met while in college and had fallen in love with a Japanese girl named Aya Shimada. He later meets back up with her in Japan before having to leave the country due to the war. Through his time in Japan, he understands that they need to rebuild not be wiped out. However, he is under a deadline to find out whether the emperor should stand trial for war crimes. It is a race against the clock to gather evidence to support for the emperor and to spare his life. This is based on a true story. Given the nature of such films, there were some liberties taken with the facts. However, the story itself is told rather well. Tommy Lee Jones does a great job in the role of General MacArthur. He plays the role not as a caricature of the man but in a realistic manner. Matthew Fox does a good job as he has to carry the film. His character is center stage and is the lens for which we are to care about the people of Japan while other characters so little to no concern. Aside from Jones and Fox, there are mostly unknown actors to Western audiences. The majority of the cast are Japanese. The production of the film itself is a joint venture between America and Japan. The film premiered at the 2012 Toronto International Film Festival on September 12, 2012. It was then released in limited theaters in the U.S. on March 8, 2013. It was then followed with a theatrical release in Japan on July 27, 2013. 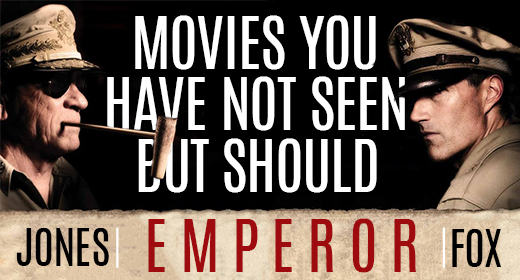 Emperor is available on DVD, Blu-Ray and Amazon Instant Video. For those who are into historical dramas, World War II films, or fans of Tommy Lee Jones or Matthew Fox, this is a good film to check out. Given its limited theatrical release, it’s a film that you may not have seen, but you should.